Taster bottles: We had four flavors of liquids: salt water for salty, sugar water for sweet, lemon juice for sour, and soy sauce for umami. We had pipettes with each. We had an adult man the station, to minimize germ contagion (i.e. the child putting the pipette in their mouth, sucking sugar water out and putting it back in the container!) You could either ask children to tip their heads back and open their mouths and drip a few drops on their tongue. Or, you can put a few drops in a spoon and they drink it off the spoon. (Original idea from Gift of Curiosity, more ideas at Living Montessori Now.) Ask them which taste they think it represents. 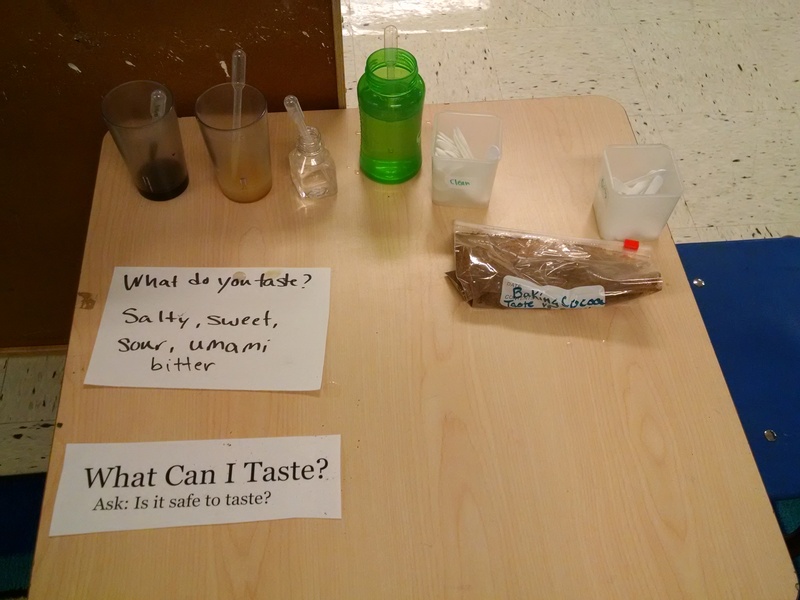 To extend this activity, you could also ask them “what foods taste sour [sweet, etc. ]” and make lists of ideas. Or, you could take them to the kitchen and have them find foods for each category. Baking cocoa: We had a plastic bag of baking cocoa. We’d have kids smell it… mmmm…. smells like a chocolate bar. Then taste it… yuck! Bitter. Snacks: In our two morning class, we offered two snacks: popcorn and apples. In the afternoon, we had a collection of four tastes. With the popcorn, kids were asked how many senses they use when eating popcorn. Can you smell it? Did you hear it popping? Now can you hear it crunching in your mouth? Can you see it – what does it look like? Can you taste it? Can you feel it – what does it feel like? With the apples, we had four varieties of apples. Children were asked to try a slice of each and decide what their favorite was, and try to describe the different tastes. This taught vocabulary like sweet, tart, juicy, crisp, sour, grainy. We had four items, each representing a taste – raisins for sweet, goldfish crackers for salty, salsa for spicy, and granny smith apples for tart. Kids were encouraged to taste each. They were also encouraged to try plugging their nose while eating to see if that changed their perception of how the item tasted. Which is strongest? Another taste idea: mix three to five cups with varying strengths of the same substance (for example, 100% juice; 75% juice / 25% water; 50/50, 25/75, 100% water). Have them taste each, and put in order from strongest to weakest. Taste – to discuss: If we had more time, there’s more to discuss. For example, that not all things are safe to taste! Also, the idea that most things that aren’t safe to eat taste bad to us, so if something they thought was OK to eat tastes bad, they should ask a grown-up. But, on the other hand, some things that are good for us don’t taste good. For example, many bitter foods are full of healthy antioxidants, but kids tend not to like bitter tastes. 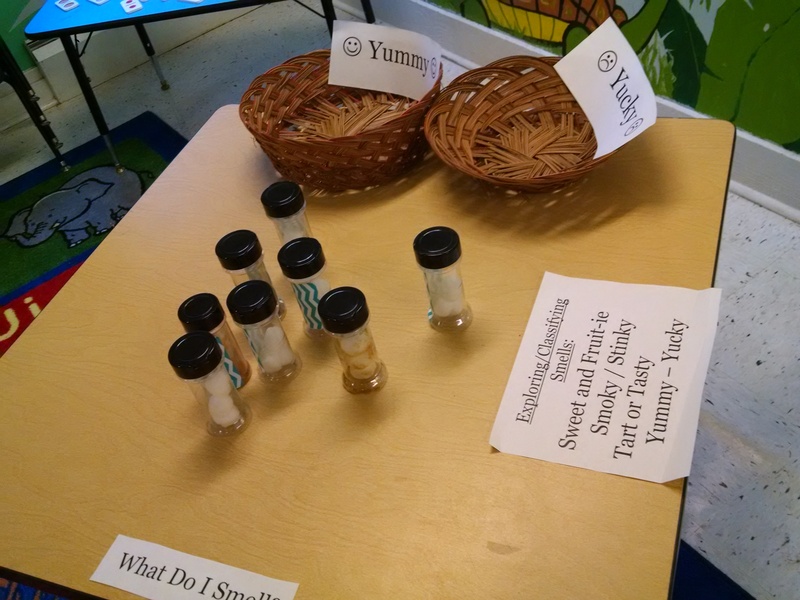 With the taste activities, we had talked to kids about the smells, and also about how smelling something before tasting it affects the taste. When we went for our hike outside, we talked about what we could smell out there. Scent bottles: We used spice bottles from the dollar store. Into each, we put cotton balls that we had dipped into something fragrant. We had cinnamon, curry powder, coconut oil, peppermint extract, lavender, vanilla, vinegar, and rubbing alcohol. Kids would pop open the shaker lid, smell the item, decide whether they liked the smell (yummy) or not (yucky) and place it in the basket. (On reflection, we had mostly pleasant smells, and we could have used more “yucky” smells. Maybe some onion or garlic, a strong-smelling cheese, coffee grounds, spicy salsa?) This activity was also a small motor skill for some of our younger kids as they had to learn how to flip open the lid. Note: if you don’t have spice bottles, it also works to collect (and clean) yogurt containers with lids. Then cut slits in the lid. When a child squeezes the sides of the container, a concentrated puff of air comes out the top which is easy to catch the scent of. You could also fill with food items, rather than concentrated scents. Such as lemon slices, strawberries, cinnamon toast, and so on. To extend this activity, could have out photos of the various foods. The foods are inside opaque yogurt containers where the kids can’t see what’s in there. They squeeze it, smell it, then place the container on the picture of the food they think is in there. When they’re done, they can open the lids and see if they’re right. That smells bad! An interesting activity to put together would be bad smelling things: sour milk, over-ripe fruit, smelly permanent markers, sulfur, those “natural gas smell” cards that gas companies send out, bad smelling household chemicals (be sure they’re safe to breathe in!). Kids could smell them, and then talk about how bad smells can be a sign to us that something isn’t healthy for us to be around. The challenges with this activity would be to ensure there was nothing harmful about these scents. You’d also want to be able to get rid of the scents after the activity and not have them linger in the room!